As an applications engineer at Quanser, I often travel to academic institutions around the world to conduct training sessions for users of Quanser systems. My usual procedure is to install different experiments and then go over them one-by-one, training my audience on our software and our hardware, demonstrating what the experiment can do, discussing what type of research can be done with the system, and of course, what its real life applications are. However this trip was different. I did all of the above, but instead of addressing faculty members from one university’s engineering department, I was standing in front of engineering faculty from many different universities in the Pune and southern India regions. That is because we were inaugurating the very first Quanser Center of Excellence, situated at the College of Engineering at Pune (CoEP). The Quanser Center of Excellence is a new and exciting Quanser initiative. It is a regional controls lab and a knowledge center. Its role is to be a hub of engineering expertise that all engineering institutions within a particular region can use to serve their education and research goals. In southern India, faculty from CoEP and other schools in the region can come in and start using the devices in the lab, perform their research, collect their data and go. Research at the Center of Excellence can also be conducted through remote connection. Researchers can collaborate and learn from one another, all while having hands-on access to our control software and a wide range of our on-site hardware in the mechatronics, unmanned vehicle systems, robotics, structural engineering and rotary areas. The numerous available experiments were chosen after consultation with CoEP and our distributor in India, Edutech. They cover a wide range of control applications, starting with basic control topics. Faculty who make use of the Quanser Center of Excellence, Pune will get preferred technical support from Quanser, the latest curriculum updates and special access to our engineers. As you can see, the potential for quickly expanding their knowledge or furthering their research is excellent. 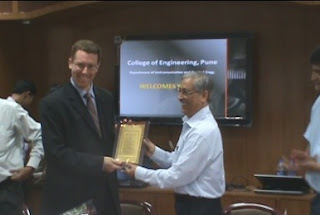 Dr. Anil Sahasrabudhe, Director of the College of Engineering, Pune and Keith Blanchet, Quanser Director of Business Development at the Opening Ceremony of the first Quanser Center of Excellence. I was in Pune for three very busy and active days. To make the training session relevant and successful, I sat down with the lab supervisor of the Center of Excellence, Pune, Dr. Pramod Shendge, the day before training started. He mentioned that many of the professors who’d be using our devices were highly focused on research. So I suggested that we dedicate one full day out of the three day workshop just to going over QUARC control design software. We did that, covering the basics of QUARC to the professors off to a good start. Since QUARC comes with plenty of demos and complete documentation and tutorials, they would be able to continue learning on their own. We spent the second day explaining eight key control experiments, going through them individually and talking about the real-world applications these experiments related to. One example was the Active Suspension experiment and its application as the suspension system on an automobile driving down a bumpy road. On the third day everyone got hands-on experience with the eight experiments. Each attendee came up and ran some experiments, tuned them a bit, and changed some parameters. Before the end of the training session, everyone had a chance to work with each experiment at least once. I have to say their grasp of the experiments was remarkable. During the training session, educators from the Pune region got hands-on experience with the new experiments that will serve students and researchers at the first Quanser Center of Excellence. If you were to ask me what the attendees got out of the three days at our first Center of Excellence, I'd say that they saw the teaching and research potential of our product lineup, but beyond that, they also understood the real value to be derived from the educational and knowledge hub that the Center of Excellence represents. Without us at Quanser being directly in the loop, they can actually start talking, sharing results and collaborating among themselves. The potential for accelerated learning, research and innovation is enormous. All of us at Quanser anticipate great progress and look forward to telling you more about the Quanser Centers of Excellence in the future.